Detroit Olympia was an indoor arena that stood at 5920 Grand River Avenue in Detroit from 1927 until 1987. It was best known as the home of the Detroit Red Wings hockey team of the National Hockey League from its opening until 1979. Several Detroit businessmen organized the Detroit Hockey Club, Inc. in 1926 and purchased the Victoria Cougars hockey team, along with a site at the corner of Grand River Avenue and McGraw Street to construct an arena. In July 1926, the Detroit Hockey Club unveiled drawings for the Olympia Stadium to be built on the site. The cornerstone for the building was laid by Mayor John W. Smith on March 8, 1927. The Olympia opened on October 15, 1927; at that time the only other buildings that exceeded its seating capacity were Madison Square Garden and the London Olympia. The opening event was the International Stampede and Rodeo, which ran from October 15 to October 22. Shortly thereafter, the primary tenants of the building, the NHL Cougars, began their long residence. The Cougars played their first game at the Olympia on November 22, 1927, and Detroit's Johnny Sheppard scored the first goal at the new building. However, the visiting Ottawa Senators defeated the Cougars, 2–1. The Cougars later became the Falcons and finally, in 1932, were named the Detroit Red Wings by new owner James E. Norris. 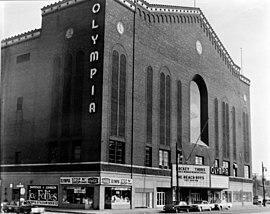 In addition to the Red Wings, the Olympia was also home to the Detroit Olympics International-American Hockey League minor league team in the 1930s and the NBA's Detroit Pistons from 1957 to 1961; that period marked the only time until the opening of Little Caesars Arena in 2017 that the Red Wings and Pistons shared the same arena on a full-time basis. It hosted the NBA All-Star Game in 1959 and the NCAA Men's Ice Hockey Championship (known as the "Frozen Four") in 1977 and 1979. The Olympia was also a major venue for boxing through the International Boxing Club (featuring such prominent fights as Jake LaMotta's defeats of Sugar Ray Robinson and Marcel Cerdan as well as other fighters of the time such as Tami Mauriello) and professional wrestling, as well as other events such as the American Legion Convention of September 21–26, 1931 which was addressed by President Herbert Hoover, and regular visits by the Harlem Globetrotters, Ice Capades, Shipstads and Johnson Ice Follies. It hosted concerts by The Beatles on September 6, 1964 and August 13, 1966, as well as concerts by other popular performers and bands, including Led Zeppelin and Elvis Presley. After the NBA's Detroit Pistons moved from Cobo Arena in Detroit to the Pontiac Silverdome in suburban Pontiac in 1978, the Red Wings seriously considered moving to the suburbs. The neighborhood surrounding the Olympia had been in decline since the 1967 riots, and two murders occurred within the building's shadow. The city of Pontiac offered the team a new arena, and Red Wings owner Bruce Norris was seriously considering the offer when the city of Detroit proposed a riverfront arena for one-half of the rent that Pontiac was seeking. The package included operational control of both the new arena, nearby Cobo Arena and the adjoining parking structures. The Red Wings accepted Detroit's offer and moved into the new Joe Louis Arena, in the middle of the 1979–80 season, on December 27, rather than at the beginning of it as initially planned, due to construction delays. The Olympia was considered to be a well-constructed building. Lincoln Cavalieri, general manager of Olympia Stadium, once said, "... if an atom bomb landed, I'd want to be in Olympia." Cavalieri, along with many in the Red Wings organization, was sad to leave it behind. On December 15, 1979, three days after the first event held at Joe Louis Arena, the Red Wings played their final home game at the Olympia, a 4–4 tie against the Quebec Nordiques. Attendance at that game was 15,609. The Olympia was included in part of the celebration of the 32nd NHL All-Star Game, which took place at Joe Louis Arena on February 5, 1980. Because a provision in the Wings' lease with the city of Detroit prevented the Wings from operating Olympia Stadium in competition with Joe Louis or Cobo Arenas for events, or selling the building for use as a competitive venue, the building was shuttered permanently, and demolished in September 1987. However, the Olympia name lived on via the Olympia Stadium Corporation, which had been formed by the Norrises in the 1930s as the Olympia's management company, and took over the operation of Joe Louis Arena after the Wings moved there. Now known as Olympia Entertainment, it continues as the management company for "The Joe's" own replacement, Little Caesars Arena. Overhead exit signs erected in the early 1970s along the Jeffries Freeway mentioning Olympia Stadium were removed around 1980; the signs would be stored in the lower levels of Joe Louis Arena. The original OLYMPIA letters that adorned the sides of the building were placed into storage, then later installed in Little Caesars Arena in 2017. Currently, the Michigan National Guard's Olympia Armory occupies the site. A historical marker is posted inside the armory commemorating the Olympia. The building was 32.6 m (107 ft) tall and constructed of a steel frame faced with red brick with brown terra cotta and stone trim in a Romanesque Revival style. The Grand River and McGraw facades originally included 13 storefronts. Near the parapet were terra cotta medallions depicting various athletes. When it opened, Olympia contained the largest indoor skating rink in the United States at 242 ft (74 m) by 110 ft (34 m). The Grand River facade featured three-story arched windows with a large recessed arch in the center. The large arch originally was filled with black glass, however in later years it was covered with wood painted with the Red Wings emblem. Topping the facade was a pediment creating a gable-shaped roof. The arena had five levels. The ground level through which patrons entered and featured a concourse that circled the seating area. Above were the mezzanine, main seating level and balcony. A fifth level not open to the public was just under the roof trusses. The trusses spanned 186 ft (57 m) and were 90 ft (27 m) above the floor. The initial seating capacity was 11,563. On June 23, 1965, work began to add 81 ft (25 m) to the rear of the structure. The addition was four stories high and included additional seating and an escalator to improve patron access to the upper levels. It expanded seating to 13,375 in 1966 with standing room for 3,300 during hockey games. In addition to the new seats, the original 11,563 seats were replaced at a cost of $23 each and new boards and timeclocks were installed. While not one of the most decorative, architect C. Howard Crane considered Olympia one of his most significant buildings. He noted the importance of the refrigeration system buried beneath the concrete. Within the 77,393 sq ft (7,190.0 m2) of available floor space were 74,880 ft (22,820 m) of piping. The system was replaced in 1967 and the final modification to the building was the addition of private boxes in 1970. ^ Avison, Charle s. "Olympia Stadium". HistoricDetroit. Retrieved February 27, 2015. ^ "Stadium Construction Financing: If You Fund It ..." Crain's Detroit Business. April 13, 2014. Retrieved February 27, 2014. ^ a b Wimmer, Robert. Detroit's Olympia Stadium. Chicago: Arcadia Publishing. p. 10. ISBN 0-7385-0787-3. Retrieved February 27, 2015. ^ "$1,250,000 Arena Planned for City: Detroit Hockey Club to Build at McGraw and Grand River Avenues". Detroit Free Press. August 1, 1926. p. 5. ^ "'Stone Is Laid: Mayor Smith Wield Trowel at Olympia". Detroit Free Press. March 9, 1927. p. 18. ^ a b "Cowboys Here to Open Arena: Great Olympia's Doors to Swing for Public Today; Formal Dedication Monday". Detroit Free Press. October 15, 1927. p. 4. ^ a b c d "Olympia Arena, 5920 Grand River Avenue, Detroit, Wayne, Michigan". Library of Congress-Historic American Building Survey. 1986. Retrieved January 21, 2011. ^ "Wings of Legend-Johnny Sheppard". Detroit Red Wings. Retrieved January 21, 2011. ^ Haddad, Ken (September 21, 2016). "This isn't the first time the Pistons and Red Wings shared a home". WDIV-TV News]]. ^ "The Beatles North American Concert Tickets". rarebeatles.com. 2001. Retrieved August 17, 2013. ^ a b "Arena Information". Detroit Red Wings. Retrieved January 21, 2011. ^ "Old Olympia letters go up at Red Wings new home, Little Caesars Arena". WXYZ-TV News. August 30, 2017. ^ "Olympia Stadium". Emporis.com. Retrieved January 21, 2011. ^ Falls, Joe (September 30, 1995). "Those Magnificent Men in Red". The Detroit News. Retrieved January 21, 2011.